SummerChasers Stories: Oct.24-25 Adventure in samWAENG! If you want it done right, do it yourself - so we rented a car and set off to create our own tour. There are road maps created by a motorbike group giving suitable day trips from Chiang Mai and surrounding areas. 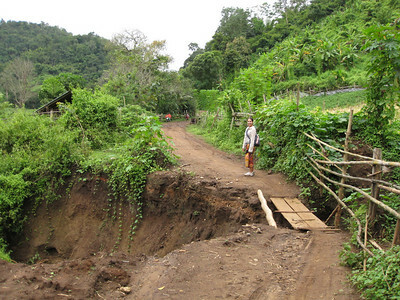 We found one for the Mae Sa loop around Doi Suthep (Sutep Mtn) that appeared to provide a good taste of the countryside. In our little Toyota Vios (compact sedan) we set out and stopped at a Tesco (sort of like SuperStore/Walmart) for some supplies since they are the only place that we can find cheese and crackers. The hills north-west of CM are very scenic: luscious green with the tops of the hills shrouded in mist and small villages and rice fields scattered in the valleys. Stopped and bought a pomelo from a roadside stand (10ß! vs 50 at Tesco and this lady even peeled it and cut if for us. Oh, a pomelo is large fruit, size somewhere between 5-pin bowling ball and a volleyball that tastes like a mild grapefruit and we're becoming big fans of them) and Julie munched on that while I enjoyed all the hairpin turns up and down the hills. We got to the halfway point of the small town of Samoeng and were pointed in the direction of Samoeng Guesthouse. It's a quaint little place in a traditional Thai style teak wooden house up on stilts. Very nice woodwork that would probably cost a fortune back home. There was a map on the wall pointing to some hot springs just up the road, so we figured we'd go there in the morning. We had a good map and it showed the hot springs on it and also showed that there were some dirt roads to travel to get there, but we didn't rent the 4x4. So when the pavement suddenly ran out and the road turned to wet clay I had my doubts of continuing. But Julie can sniff out a hotspring! We asked some kids (Ai and Bia- ha ha his name is 'beer' in Vietnamese) for directions and got some strange looks driving the little car down the back roads. And then it got worse: it had rained and the road disappeared into mud and water. "We've gone this far!" Julie says so we stop the car and continue on foot. I see some buildings up ahead and oh look! the road's washed out with a board laid across for motorbikes. We get to the buildings and it looks like it would have been a nice resort back in the day, but the pool's empty and bridge is collapsed. [Tony G, I've got your next investment opportunity!] Other than being inaccessible the place is in perfect condition & open so we use the toilet. Some more buildings are visible a little way up the river so we walk up and sunuva- PongKwao Hot Springs! The gate's closed (no wonder since the road is washed out) but we squeeze through and go in. We walk around a building and lo'n'behold there are people! A lady sees us, comes over with 2 folded towels and says "hot springs?". I'm still flabbergasted by it. The 4 people working there seemed indifferent to us walking up and continued playing cards while we swam and had Mr.Noodles. The hot water was surprisingly nice given the air temperature and I hadn't felt that good walking out of there in a long time. The place had 2 large pools along with a handful of personal pools each in it's own hut. We walked back to our car only to discover a flat tire. I position the car on a level spot on the small road to change the tire only to discover that there's no jack. Honestly! And then a pickup truck comes around the bend, squeezes past us on the narrow road and stops to help. Fortunately it was carrying 6 guys who lifted the car onto a bottle jack that they had. Quickly changed the tire and go lower the car - no, wait, the jack's jammed. So we lift the car up off of the jack and set it down. We smile and bow our gratitude and head back to Chiang Mai. This is what I call choose your own adventure!